Melissa Lindahl is a self-taught jewelry maker living Cleveland, Ohio. She gathers inspiration from nature on hikes in local forests and is especially intrigued by the limitless expanse of colors she finds through the seasonal changes. Melissa has lived and traveled around the world and feels those experiences have enhanced her ability to see creatively and abstractly. Melissa is supported in her work by her family and exuberantly affectionate rescue dog. 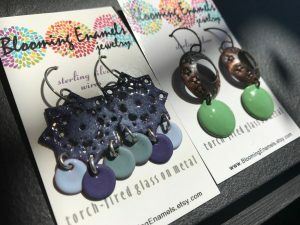 In support of our working artist members, enter our May giveaway for a chance at one of two pairs of beautiful earrings when you visit us this month. No purchase necessary.